Last forum of the year. Very grateful for all the support I have had through this election season. VERY, VERY proud of Cindy and Missy. They are great friends and I hope we all have 4 more years together. 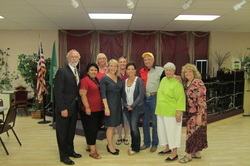 Check out The Columbia Basin Herald for full video of this event at the Ephrata American Legion. Michele destroyed her opponent this night. Crew at Wilson Creek Parade. Last parade of this campaign. Now the forums. (Sept. 4) Warden parade today. Always a good parade and crowd. It was a lot of fun watching Arnold running form curb to curb visiting with his family and friends. We really appreciate all the support from our friends taking their time to walk in the parade for me. Beautiful day for a parade. 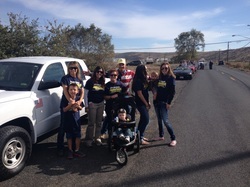 A big thank you to Lori, Jodi, Lance, Parker, Emma, and Sarah who joined us at the Mattawa parade. Very nice crowd and fun in the park. Royal parade is always a lot of fun. Great crowd and really nice people in Royal. Since Dave is Royal's Middle School principal, I think this is his favorite event. Saturday was a "Get it done" day. 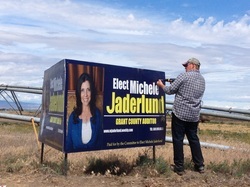 Placed signs in the morning, Soap Lake Suds and Sun Festival in the afternoon, then to Moses Lake for the Freedom Fest. 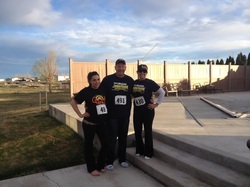 A special thanks to Katie, Adam, Dean, Sandy, and Curt for walking with us. I feel really fortunate to have my co-workers come with their families to walk in the parades with me. We have established a tight knitted team at the county. 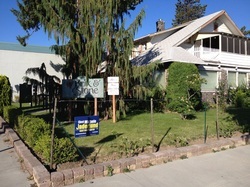 Thank you Del Christensen for the sign placement and your support. Looking forward to the Mattawa Community Days this year on Saturday, August 4th. Little known fact...Sage and Sun is the oldest continuing run community event in Washington State. 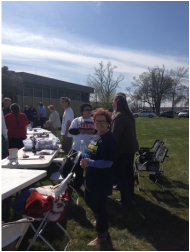 Great day with supporters and fun seeing friends on both sides of the streets all the way through town. 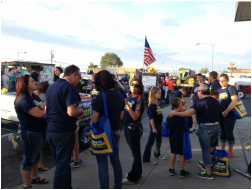 Big thanks to Cindy Carter for letting us hang with her crew at the Moonlight Parade. That was the fastest we have ever walked in a parade. Great crowd and a lot of fun. First Parade and a great way to start. Coulee City is a cool town and the people love their parade. Wilson Creek Harvest Festival was a lot of fun. Got to hang with friends and eat some great caramel apples. Last parade of the year and the weather was great. Fun night at the Sip of the Slope. Royal City has a great event with the mixture of food, music, appetizers, and the wines. If you missed it, put it on your calendar for next year. Tear down at Quincy Farmer Consumer Awareness Day. HUGE Thank You to Sandy, Cathy, Rachel. Mark, Shannon, Shea, Lori, Cory, Lance, Emma, Laycee, Tayton and Dave for participating in parade. 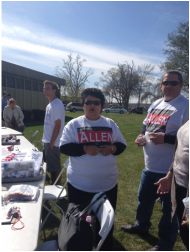 I have had the best group of supporters for each and every event. It's fun because Missy (who also has a great group) and I have people working with us and helping us keep our energy up. Met a large number of new supporters who want to have an Auditor that is truly concerned about the people of Grant County. They especially want an Auditor who doesn't skip out on work to campaign or do any number of things. They want an Auditor that uses their Tax Dollars to do the job assigned to them. Helping set up tents at the Quincy Sports Complex. Had fun tonight hanging out with friends and preparing for tomorrows events in Quincy. This is going to be a great time and I look forward to meeting people at our tent. I have a new informational sheet I'll be passing out tomorrow. It should provide the voters with some clear information about how their tax dollars are be used...and misused. 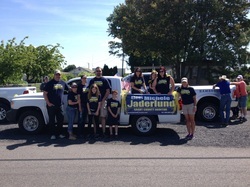 Beautiful day at the Warden Community Parade. Got to meet a lot of people from Warden today. It was fun to hear all the positive comments about Melissa McKnight's husband Chris who is Principal at the Middle School. I find it interesting how both Dave and Chris have ended up as Middle School Principals in Warden and Royal. It seems like yesterday that Dave was coaching and Chris was playing on the State Championship Football team for Ephrata. Really appreciated Sandy, Cathy, Lori, Kory, Lance, Emma, Katie, Veronica, Laycee, Taylor, Tayton, and Dave for supporting me today. Had some great food and enjoyed talking to Rick Martin, Chief of Police and Chairperson on Warden School Board. I was fortunate enough to meet Doug Skone and Aaron Golladay on Saturday at the PAWs Fundraiser. These are all people who are working to make Warden the best Community possible and from what I saw today they are doing a great job. Michele making friends at the Summerfest in Royal City. Travel Crew. As usual, loud and rowdy. Another fun day at a great parade. I want to thank the Moses Lake Kiwanis for inviting me to speak to them today. I think I gained as much from them as I shared. Especially liked the discussion on transparency and being available to the public. Thank you Mick Qualls from the Famous Hot Rod Garage. It was quite an honor to speak at your get together on Thursday. 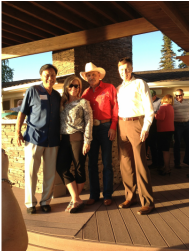 I have really enjoyed getting to know Dan Newhouse, Tom Dent and Garth Dano on the campaign trail. I do have to admit it is more than a little intimidating to speak after Dan Newhouse. He is a great candidate and truly fine person. I have a strong feeling both Dan and Janea will be fighting it out in November. Tom was his usual gracious self. I have really enjoyed getting to know him and his wife Dayna. Garth was his straight shooting self. He has the experience and history in Grant County to make a difference. Finally, thank you Mick and the Hot Rod Garage Crew. These are the grass roots people that make America Great. This was a night I will always remember and people I will think of when I am working as Grant County Auditor. 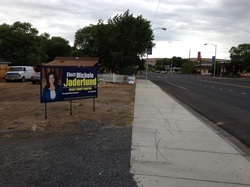 Thank you Mick Qualls for the Road 4 and Dodson sign location. Thank you Heather Maddox owner of Pampered Pet Boutique in Moses Lake for the fantastic sign location. Thanks to Dwight and Linda Bonneville for the Brix and Stone sign location. We always enjoy spending time at Brix with the Bonneville's and their friends. 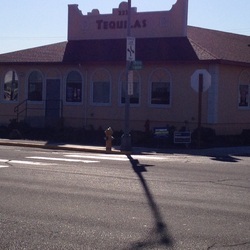 Thank you Raul and our Tequila's family for the Basin Street sign location. Thank you Jeff Grass at Blue Lake Resort for the great sign location. 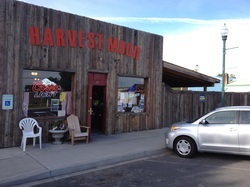 Thank you Harvest Moon in Wilson Creek for the Railroad Street sign location. 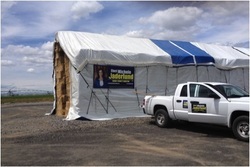 Thank you David Spencer for the Jolain storage location on Hwy 17. 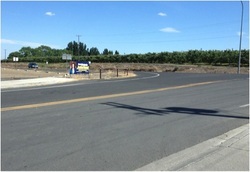 HWY 26 and Royal City entrance at "SPUDS"
The Republican Women of Grant County scheduled Dan Newhouse to speak at their meeting on Tuesday held at the Moses Lake Senior Center. 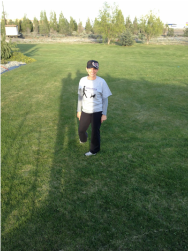 Thank you Lynne Nelson for the GREAT location in Soap Lake. Special at the Garden Grill & Bakery today. Makes putting up signs a lot easier. 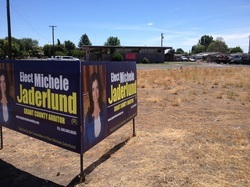 Thank you Jennifer Herring for the HWY 283 road site. Thank you Cindy Carter for the HWY 26 haystack. Back row: Baily, Laycee, Tessa, J.D., Shawn, Sage, Elise, Cathy, Rachel, Mark, Sonia Lori, Cory, Brent. Front row: Grayson, Marla, Dayton, Taylor, Tayton, Kennedy, Michele, Bradon, Sandy, Emma, Lance, Emma, Liam. Had a terrific night with a great crowd. It is really great to watch Janea meet and greet new people. She is a terrific person who treats everyone she meets like a VIP. It was my first time meeting her husband and son. They are a very nice family. A big Thank You for the endorsements and donations from tonight. I promise I will never let you down. Finally, I can't thank Mike Scelleck enough for the donation of the Nat Washington House. This is a wonderful piece of history that we are lucky to have preserved for us. The kindness from the people I have gotten to know through this process are the reason that I live in Grant County and will never let you down. 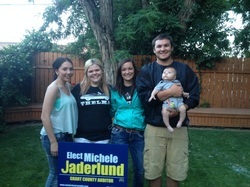 Laycee, MacKinzie, Tessa, J.D., and Tayton enjoying the wonderful evening. It was also fun as always talking to the Bedford's. Both Brent and Billie have a long history with Janea and I. It seems we were some of Brent's first customers and have appreciated his care throughout the years. They are great company. I am ecstatic to announce Janea and I will be hosting a Meet and Greet June 12 at The Nat Washington House in Ephrata. The details will be coming soon. If you are interested in attending we are asking for a RSVP to help us prepare but there will be a time set for those of you who would like to drop in. A Special Thanks To Larry Myrick, Wine Maker Frenchman Hills Winery for his donation of wine for this event. Thank you to Sundowner for letting me place my 1st Road Sign. I'll have the others o﻿ut in a week or two. Please let me know when you see one. Also...Hope to see old friends at the 100 year reunion the next few days. 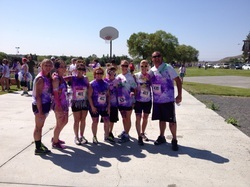 Over 450 runners attended the 1st Dash Of Color in Ephrata. The atmosphere was fun and a little crazy. As you can see from the photo this a colorful event that supported a good cause. This was another example of why I love living here. 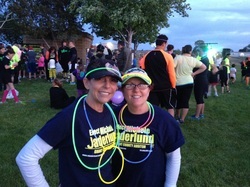 Twenty-one supporters walked with Michele in the 34th Annual Moses Lake Grand Moonlight Parade. 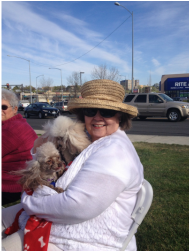 It is always nice to be with friends and there were plenty on hand Saturday. It was a lot of fun to watch Rachel walk into the crowds lining the street and hug old friends that she has known throughout the years. Dave spent the majority of his time talking to families from Royal City who were there to watch. Every time you looked around someone was tossing candy or glow sticks to the kids, waving signs, chanting "Jaderlund", or rousing the crowd. Sandy stirred up people throughout the route. 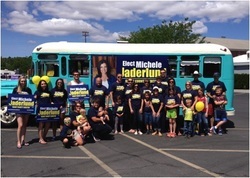 This is a big event and Michele really appreciated everyone for taking their time to walk in the parade and supporting her. These are the things that make a difference on election day. Wow...what a night! Had a terrific time at Don and Janea Eng's home last night. They were hosting a fundraiser for Tom Dent who is running for the seat being left by state Rep. Judy Warnick, in the state House of Representatives. I don't know where to begin. The host and his wife were wonderful. The home was beautiful. 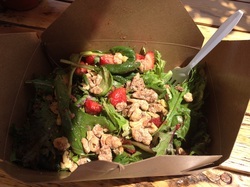 The food was fantastic. The people were having a great time and all were very interested in making sure the right candidates are elected into office this year. Rob McKenna, Former Attorney General of Washington State flew over with Tom for the event spoke highly of Tom and the importance of Grant County. I was fortunate enough to get the endorsements of Tom and Dayna Dent, Dino and Rhonda Cacchiotti, Bob Fancher, and Bill West. This was a great fundraiser with wonderful people. Good luck Tom! This one-of-a-kind experience is less about how you run but more about how much you glow! Fantastic Fundraiser set up by the PTO. We missed you Katie, we hope you feel better. I want to thank the Young Professionals for inviting me to this event. Since I was unable to attend my husband Dave went and was very impressed with how well it was run. The candidates answered questions posed to them and had the opportunity to share their political positions. Of course we feel Janea was outstanding, but the other candidates did a good job sharing their positions also. 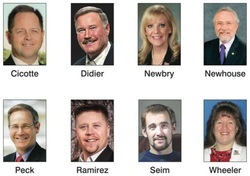 A special thanks to The Young Professionals for announcing my candidacy and understanding my absence. 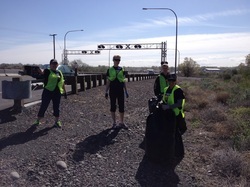 We had a great, although tiring day helping to clean up areas around Moses Lake. This is a great event and one that deserves the support of our area. We live in a beautiful area and need to keep it that way. 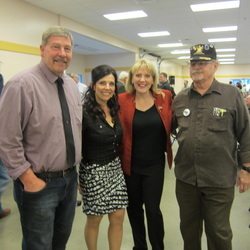 Michele with Janéa Holmquist Newbry at the Lincoln Dinner in Moses Lake. 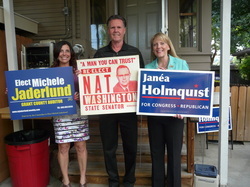 Janéa offered her support and told Michele "I know you will be a terrific Auditor". Something in which we all agree. filled in for Dave who had to work. This run is for the Saint Lukes Rehabilitation Institute. I highly encourage others to support this race in the future. It is for a terrific cause. 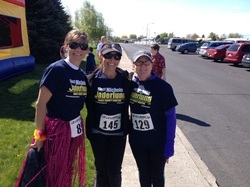 Cathy, Michele, and Sandi before the Coconut Crawl. Post event picture. 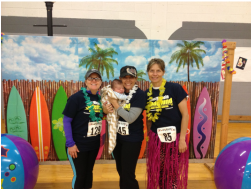 Sandi, Michele, and Cathy with Tayton at the finish. Orvella Fields at the Tax Day Rally. Now that looks like a good time. Although windy and cold, Orvella always has a smile on her face. Sandy toughing out the wind and providing me with support. A true friend. Kim Allen working hard as always. You can tell the people who want to serve.